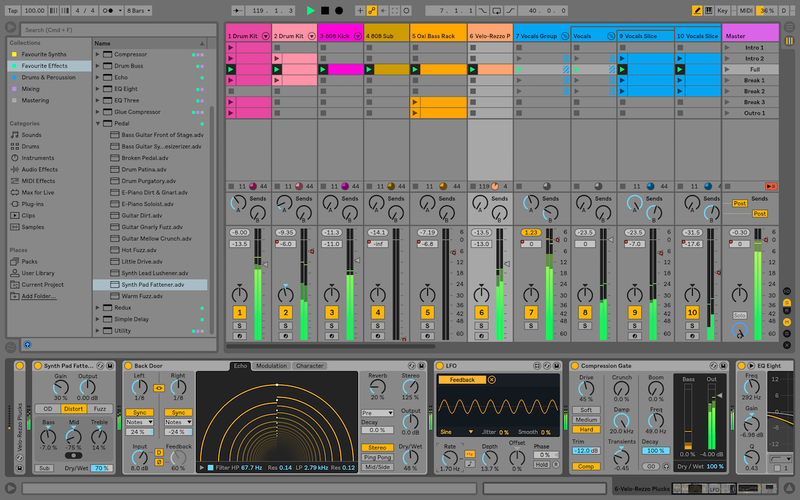 Ableton Live 10.0.3 – Record music using digital instruments, loops, and more. Ableton Live lets you create and record music on your Mac. Use digital instruments, pre-recorded sounds, and sampled loops to arrange, produce, and perform your music like never before. Ableton Live is an all-in-one production suite. Start in Arrangement View. Create and edit multitrack recordings in a straightforward linear view. Go further in Session View. Switch to this one-of-a-kind interface to improvise and experiment with countless sounds and loops. Access an endless palette of sounds. With 5 built-in synths, 3 samplers, 390 drum kits, and 4000 loops, the possibilities are endless. Next story MediaInfo 18.08 – Supplies technical and tag information about a video or audio file. Previous story djay Pro 2.0.6 – Transform your Mac into a full-fledged DJ system (was djay). iZotope Nectar 3.00 – Vocals, in the mix. Sound Studio 4.8.8 – Robust audio recording and editing tool. Capo 3.5.8 – Slow down and learn to play your favorite songs.